As a brand known for its multimedia, you would expect something special from Philips. 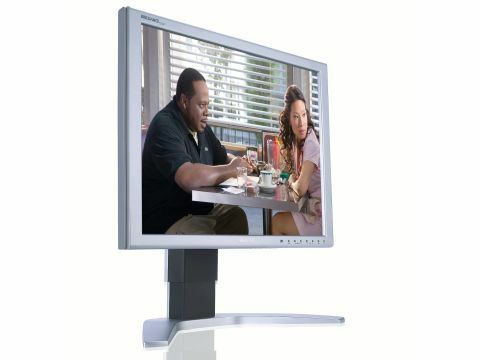 Therefore, you would be forgiven for thinking the Philips 190P7 was a bit old-fashioned in appearance, as it only measures 19 inches and sports a resolution of 1280 x 1024 pixels. However, in reality this is a sophisticated piece of kit. Unfortunately, we also came across a significant flaw, so let's get that of the way first. The 190P7 uses Philips' Super Ergo Base to give a full range of adjustment with tilt, a quarter turn of swivel and some 12cm of height adjustment plus pivot. There is no switch to tell the monitor when it has changed from landscape to portrait, so you use the supplied SmartControl utility to control the panel. SmartControl hooks into your graphics drivers and Philips warns that only certain ATi and Nvidia adapters are supported. It seems that our Radeon X1900 wasn't one of the chosen, as the software refused to work, with the result that we couldn't use the pivot function. This was frustrating as the displayed image is absolutely stunning. It is clear, bright and sharp with colours that are rich and vibrant. On image quality alone, this panel is worth recommending. In addition, the 190P7 has a few neat features, including two USB ports (cable supplied) and dual DVI inputs. Philips supplies a VGA-to-DVI cable so you can connect your laptop, even if it only has an analogue output. Remember though, the final signal will only be analogue so you will see some image deterioration. The final neat touch is SmartBright, which uses an ambient light sensor next to the control buttons on the lower bezel. When SmartBright is turned on it boosts brightness when the ambient light level rises and drops it when the room is darker. We liked the 190P7. It's a good monitor at a reasonable price. However, for goodness sake check your graphics adapter is supported by the SmartControl software before you buy.